Victoria Public Library, Cockburn Town, Grand Turk. Turks and Caicos magazines and publications. There’s an interesting selection of Turks and Caicos information sources, ranging from the quintessential newspaper and magazine, to television, radio and of course, websites. 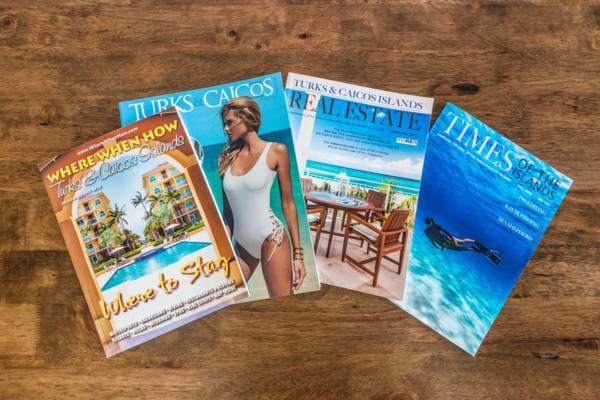 As a boutique tropical tourism destination, the Turks and Caicos supports a small yet select collection of printed publications and magazines. Many local magazines cater to visitors to our archipelago, and are available at no cost at many locations. When When How magazine has been a staple of the Turks and Caicos tourism industry for more than twenty years. This comprehensive guide can be found at no cost at many sites on Providenciales, including resorts, grocery stores, and charter booking locations. Where When How is a great complement to a vacation in the Turks and Caicos. There’s information on where to stay, things to do, dining, and much more. In its initial days in the 1990s, When When How also served as the local TV guide! The publisher of When When How also produces the excellent printed Dining Guide magazine, which offers both extensive listings on eateries on Providenciales, and in-depth reviews of a few select restaurants per edition. Like its parent magazine, the Dining Guide is free and readily available, and it’s recommended that you pick one up on arrival. Times of the Islands has been a favourite with locals and visitors alike for decades. This quarterly publication features compelling articles and photography on historical, cultural, and natural aspects of the Turks and Caicos, and day to day life here. The typical Times of the Islands edition features a collection of works which often includes an article or two on nature or the environment, the fascinating and historical Astrolabe newsletter from the Turks and Caicos National Museum, and features on what’s new in culture and lifestyle. Turks and Caicos Magazine offers a glossy insight into luxury tourism and life in the archipelago. The magazine is printed three times per year, and covers everything from who’s who, art, fashion, and dining trends, to nightlife and the newest things to do. The local Turks and Caicos Hotel and Tourism Association creates the annual hardbound Destination Turks and Caicos book, which is distributed throughout hotel and waiting rooms across the country. The book is a great reference for everything related to tourism, with details on accommodations, dining, shopping, professional services, and more. The Turks and Caicos Real Estate Association (TCREA) produces a biannual magazine which is great for those interested in moving to or investing in the Turks and Caicos. The magazine lists hundreds of available properties in the country, along with features on purchasing, investing, home building, and other real estate considerations. Discover Magazine is another glossy magazine geared towards tourism in the Turks and Caicos, with information on activities, accommodations, dining, and shopping. Discover Magazine is annual, and there are editions for several Caribbean countries including Bermuda, Aruba, the Cayman Islands, and the US Virgin Islands. Discover Magazine is handed out to guests flying on many American Airlines and United Airlines flights departing from cities such as Miami, New York, Charlotte, and Philadelphia. The Turks and Caicos supports two local newspapers; the Weekly News, and the TCI SUN. These weekly editions are the classic newspaper, with everything from news, the classifieds, employment opportunities, government press releases, and of course the ever common advertisement. The beautiful Wavey Line Publishing chart of the Turks and Caicos. 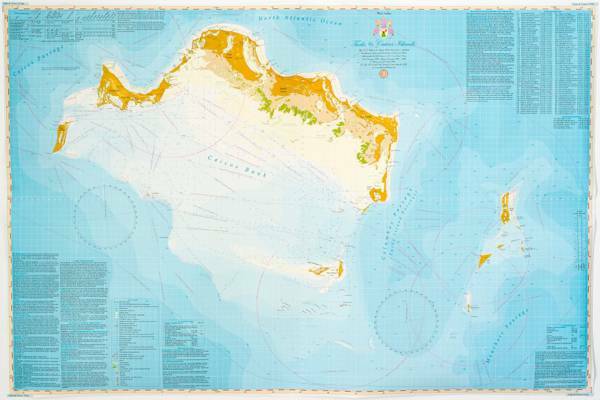 There’s a great collection of charts, including details of islands and harbours. The charts are essential for navigation, and make for excellent gifts too! Another invaluable printed source of information pertaining to the Turks and Caicos are the excellent and highly-detailed navigation charts produced by Wavey Line Publishing. The charts and maps show depths, hazards, reefs, wrecks, and harbours, and have been greatly appreciated by local vessel operators and visiting cruisers for decades. The navigation charts also make for unique and beautiful gifts, and can be found at a few shops on Providenciales. A little-known fact is that while surveying in the North Creek lagoon on Grand Turk, Bob Gascoine of Wavey Line Publishing discovered a 700-1000 year old Lucayan canoe paddle, which was in remarkable condition considering the age! He recognized the incredible historical value of the artefact, and the paddle is now one of the most important displays in the Lucayan collection at the Turks and Caicos National Museum on Grand Turk. The Turks and Caicos has two local television stations, PTV8, and Channel 4 News. There are also several radio stations. Unfortunately, there are no home-grown television programmes other than news or commentary! The United States State Deparment and the United Kingdom's Foreign and Commonwealth Office provide up-to-date travel advice by country, covering topics such as crime statistics, what to do if you lose your passport, terrorism threat levels, etc. Blog by a local resident updated frequently focusing on local events and activities.